It seems that folks have discovered that the Nintendo DS is ideal for puzzle enthusiasts, at least if the number of Sudouko games available for the DS is any indication. But if you're tired of filling in cells in a 9x9 grid, then you might want to give Picross a try. 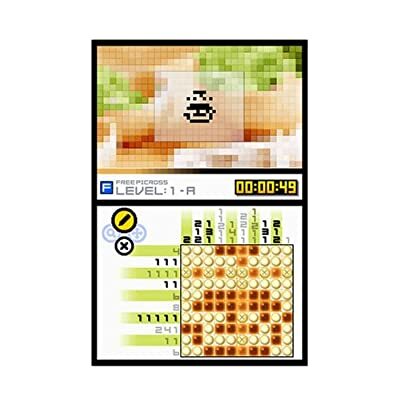 Picross is based on the logic puzzle known as Nonogram or Paint by Numbers, but with all of the bells and whistles one would expect from Nintendo. To put it simply, you have a grid with cells that must be filled in or left blank to form a picture. To figure out which cells get filled in and which are left alone, there are rows and columns of numbers on the side that indicate how many squares in that row or column get filled in. For instance, the numbers "4 2" would indicate that you would fill in four cells followed by two cells in that row. The trick is that the numbers don't tell you how many squares must be left blank, which is where logic comes in. If you've done everything correctly, you'll get a nice picture. In Picross DS, you get penalized if you make a wrong choice and if you make too many wrong choices you won't see the special animation that accompanies a finished puzzle or unlock new levels. Picross DS comes with over 300 puzzles to solve, and you can download more using the DS Wifi feature. It also has a multiplayer option where users can try to be the first to solve the puzzle or particpate in guessing games. Picross DS is priced at $19.99 so if you have a DS and are looking for a fun way to exercise your brain, you can't pass this up! Ooh! My wife loves this sort of thing! Thanks for the look! They used to have these puzzles in Games Magazine and I was hooked from the very beginning. I know you don't have a DS Mark (yet), but I know there's some versions out there you can play online.